1) Put the flour in a mixing bowl, and add the yeast on one side of the bowl, and the salt on the other (every Paul Hollywood recipe I’ve ever seen says that you have to keep the salt and yeast separate at this stage or the salt will kill the yeast). 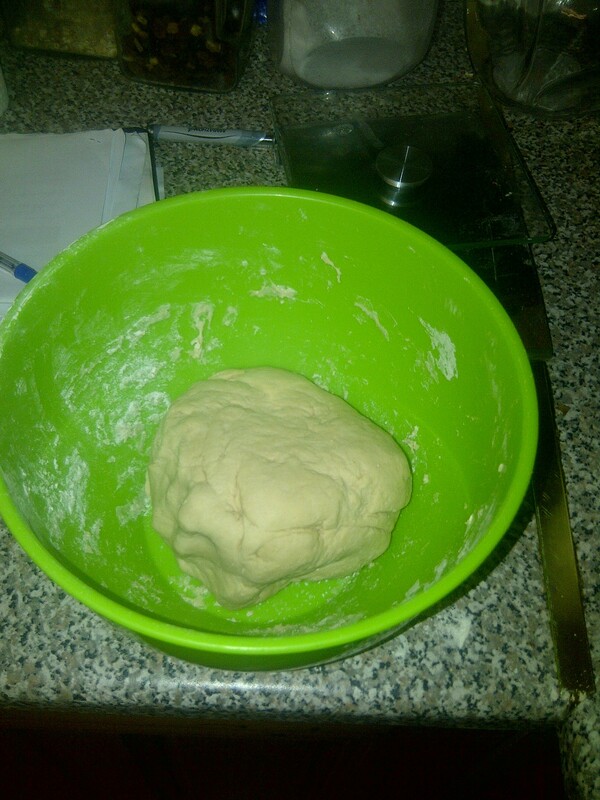 2) Pour 300ml of the water into the flour mixture and mix it in – you’ll probably need to put more in, just keep mixing it and adding water until you have a soft, but not sticky, dough mixture. 3) Tip the mixture out onto a lightly floured surface and knead it for 5-10 minutes until it’s nice and stretchy and squishy. Then lightly oil the mixing bowl and put the bread back in, and cover with cling film or a damp tea towel. Leave it in a warm place for 1 hour, or until doubled in size (anyone who’s in a cold, cold student house, it’s always a good idea to time your breadmaking to coincide with whenever the heating will be on, then you can leave your bread near the radiator). 4) Once it’s doubled in size, put it back onto the lightly floured surface and knock it back (basically punch all the air out of it). Then add the grated cheese: knead it in well. Now add the pickle: things will get a bit messy at this point so make sure you have a bit of extra flour to hand if it gets too sticky. Then put it back in the mixing bowl, cover, and leave to rise for another hour in a warm place. 5) Grease and line a baking tray. 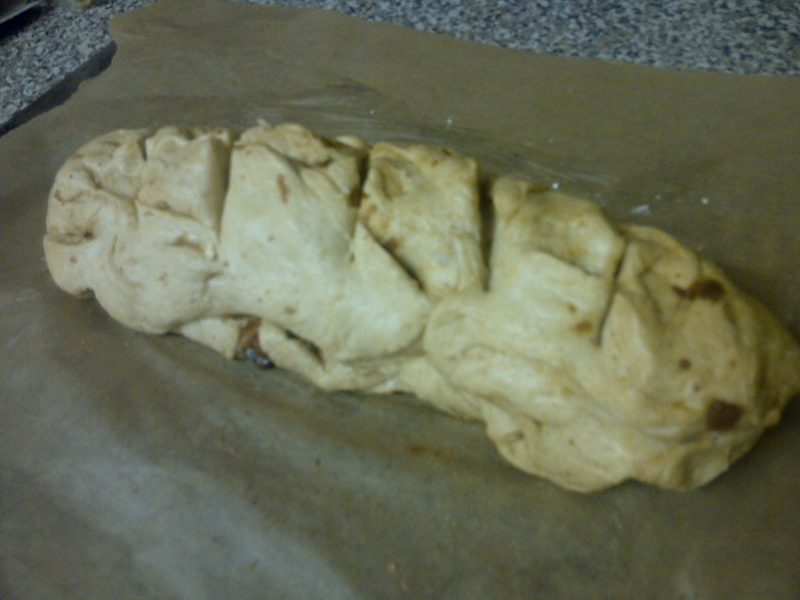 Gently flatten the bread mixture out on a floured surface, then roll it back up and put it on the baking tray. Using scissors, cut lines across the top of the loaf: Put the baking tray in a plastic bag, and leave it in a warm place for another half hour. Meanwhile, heat your oven to 200 degrees C.
Warm, cheesy, pickly bread. Definitely the cure for the cold mid-February blues. 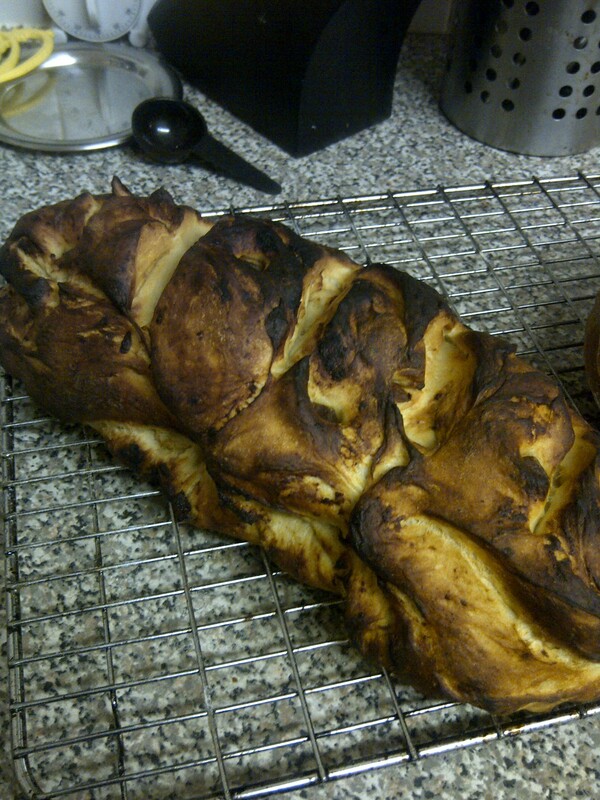 This entry was posted in Bread and tagged baking, bread, cheese, loaf, pickle, ploughman's, recipe. Bookmark the permalink. Baking Progress is growing up! Hanna Jacunski: Sometimes happy, sometimes writer. I Love Baking, Making and Crafting!